Stretch denim jeans made with a cotton denim outer with panels of Kevlar reinforcement to protect the seat, hips, thighs and knees. There are pockets to house optional knee and hip armour and the bottoms of the legs have detachable stirrups which can be used to stop the denim riding up in a crash. They’re slim fit and come in dark or light grey, blue or black. 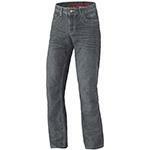 The cheapest jeans here are made from denim with aramid fibre panels protecting the knees and seat. They come with CE-approved knee armour that can be adjusted to sit in the right place and pockets for optional hip protectors. 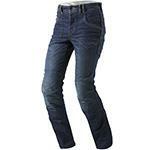 As well as denim, there are wax cotton and cargo trousers in the same style, and there are short and long leg options. The denim for these jeans is woven with Cordura to add abrasion resistance and there are also knitted panels of extra protection at the seat and knees. They’re Coolmax-treated to keep them fresh and have reflective Scotchlite material at the turn-ups. The Nelsons come with CE-approved knee armour and pockets for optional hip protection. They’re available in black or blue. The company that created the concept of an abrasion-resistant jean is still going strong, with knitted panels of Kevlar and Dyneema at the key areas. The stone-washed jeans have visible stitching where the protective panels are attached to the outer, and Draggin have other styles where the stitching is hidden. 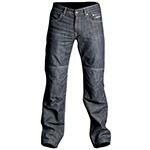 Denim jeans with genuine Kevlar protection panels, six external pockets and belt loops to keep them in the right place. Reflective detailing boosts night-time visibility. This model comes in black only, but Dainese have similar models finished in other colours.